This image shows the field of view from the Dragonfly Telephoto Array, centered on M101. 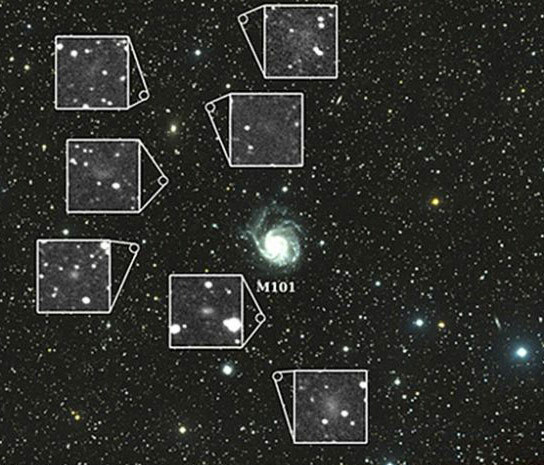 Inset images highlight the seven newly discovered galaxies. Using a new type of telescope, astronomers at Yale University discovered seven dwarf galaxies while probing a nearby spiral galaxy. Meet the seven new dwarf galaxies. Yale University astronomers, using a new type of telescope made by stitching together telephoto lenses, recently discovered seven celestial surprises while probing a nearby spiral galaxy. The previously unseen galaxies may yield important insights into dark matter and galaxy evolution, while possibly signaling the discovery of a new class of objects in space. For now, scientists know they have found a septuplet of new galaxies that were previously overlooked because of their diffuse nature: The ghostly galaxies emerged from the night sky as the team obtained the first observations from the “homemade” telescope. Pieter van Dokkum, chair of Yale’s astronomy department, designed the robotic telescope with University of Toronto astronomer Roberto Abraham. Their Dragonfly Telephoto Array uses eight telephoto lenses with special coatings that suppress internally scattered light. This makes the telescope uniquely adept at detecting the very diffuse, low surface brightness of the newly discovered galaxies. “These are the same kind of lenses that are used in sporting events like the World Cup. We decided to point them upward instead,” van Dokkum said. He and Abraham built the compact, oven-sized telescope in 2012 at New Mexico Skies, an observatory in Mayhill, N.M. The telescope was named Dragonfly because the lenses resemble the compound eye of an insect. “We knew there was a whole set of science questions that could be answered if we could see diffuse objects in the sky,” van Dokkum said. In addition to discovering new galaxies, the team is looking for debris from long-ago galaxy collisions. “It’s a new domain. We’re exploring a region of parameter space that had not been explored before,” van Dokkum said. The Yale scientists will tackle a key question next: Are these seven newly found objects dwarf galaxies orbiting around the M101 spiral galaxy, or are they located much closer or farther away, and just by chance are visible in the same direction as M101? Merritt stressed that until they collect more data and determine the distances to the objects, researchers won’t know their true nature. But the possibilities are intriguing enough that the team has been granted the opportunity to use the Hubble Space Telescope for further study. Meanwhile, there is also more work to be done with the new telescope. “We are collecting new data with the Dragonfly telescope every clear night. We’re all curious to see what other surprises the night sky has in store for us,” Merritt said. Be the first to comment on "Dragonfly Telephoto Array Reveals Seven Previously Unseen Dwarf Galaxies"